“Honesty means to give your heart to God; never to play Him false in anything; to be open with Him in all things, never hiding the truth; never to do that which deceives those above and deludes those below; and never to do that which merely ingratiates yourself with God. In short, to be honest is to refrain from impurity in your actions and words, and to deceive neither God nor man.” From God’s word, we can see the reason why the righteous and honest people could be able to gain God’s approval. And also, we found the way to become an honest person. 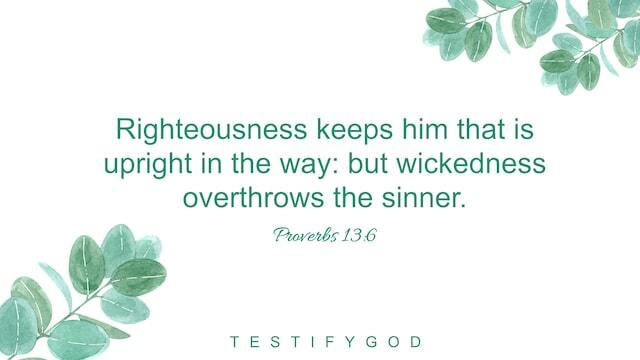 Only those who are righteous and honest can satisfy God’s will. Such people would never be able to resist or betray God, but be of one heart and mind toward God. Such people will surely be cared and protected by God. Proverbs 10:22 The blessing of the LORD, it makes rich, and he adds no sorrow with it. Reflection We can learn from this verse that what God bestowed on us is enough for us to enjoy and we should not add sorrow. However, many people are not satisfied with what they own, so they cannot stop making their way in the world, just like a tightly wound clock. Dissatisfaction has become people’s driving force, but they often live in torment because of their unfulfilled desires. Share a passage: “After they start believing in God, people gain some truths, and the happiness these truths bring is sufficient to replace the happiness brought to people by material things, enjoyment and comfort. The more you gain those things, the less satisfied you are, and the less you are able to tell good from bad. With the truth, the clearer people’s understanding of it, and the more truths they gain, the more they know to thank God and be grateful, and the more they feel sated within their hearts. Yes or no? (Yes.) What do material things bring to people? (Emptiness.) They bring emptiness and depravity. People can’t tell good from bad and they develop more and more desires.” In a giddily materialistic society, we are unable to discern what’s right or overcome sin so that we are dragged deeper into desires. Satan uses our desires and ambitions to force us to live in pain and darkness. When we have the truth as life, we know that our everything is ruled and predestined by God. Without God’s predestination, we cannot get what we want no matter how hard we work. The useless struggle will make us live a more exhausting and miserable life. Actually, the grace God bestows on us is enough. After we understand these, we should not satisfy our desires. No matter how many God bestows, we ought to feel content and praise God with our grateful hearts. The Bible says, “But godliness with contentment is great gain. For we brought nothing into this world, and it is certain we can carry nothing out. And having food and raiment let us be there with content” (1Ti 6:6-8). When we learn to be grateful and content, we can gain true joy and happiness. At last, I want to share this verse: “Rejoice ever more. Pray without ceasing. In every thing give thanks: for this is the will of God in Christ Jesus concerning you” (1Ts 5:16-18). » Recommended for you: • My Joys and Sorrows After Achieving Success • Christian Marriage Story: No Longer Complaining, She Has a Happy Marriage • How Should a Christian View Wealth? It Is Wise to Let Go Peace be with you all! Dear brothers and sisters, if you have any understanding or enlightenment from God, you’re welcome to share with us.1. Via the online chat window at the bottom right corner of the screen.2. Send an email to info@testifygod.org.We sincerely hope we’ll grow spiritually through sharing with each other.